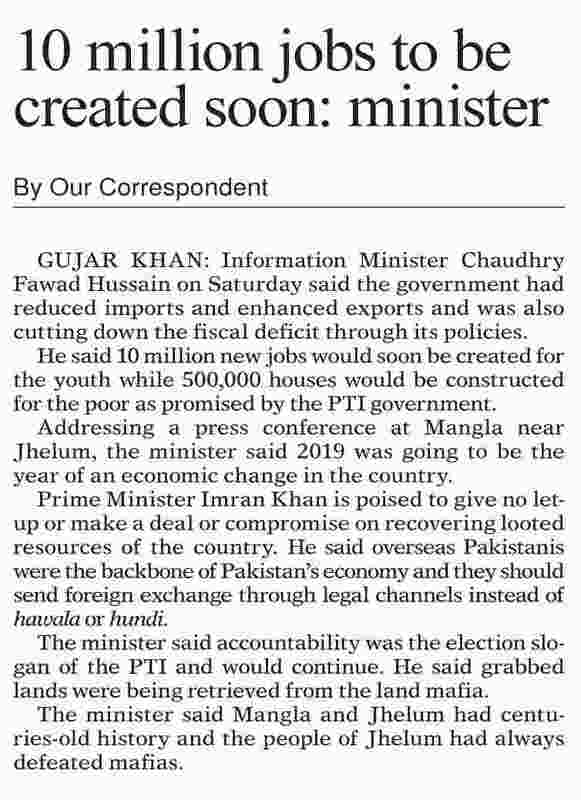 Information Minister Chaudhry Fawad Hussain on Saturday said the government had reduced imports and enhanced exports and was also cutting down the fiscal deficit through its policies. He said 10 million new jobs would soon be created for the youth while 500,000 houses would be constructed for the poor as promised by the PTI government. Addressing a press conference at Mangla near Jhelum, the Minister said 2019 was going to be the year of an economic change in the country. Prime Minister Imran Khan is poised to give no let-up or make a deal or compromise on recovering looted resources of the country. He said overseas Pakistanis were the backbone of Pakistan's economy and they should send foreign exchange through legal channels instead of hawala or hundi. The minister said accountability was the election slogan of the PTI and would continue. He said grabbed lands were being retrieved from the land mafia. The minister said Mangla and Jhelum had centuries-old history and the people of Jhelum had always defeated mafias.